Since its release on July 29, Windows 10 security problems have been garnering criticism from IT professionals and privacy activists who strongly oppose many of the default settings in Microsoft's latest operating system. To help you, BestVPN has decided to bring you this easy to follow quick guide which will allow you to disable Windows 10 data collection. Firstly you will want to deal with the tailored adverts system, you do this in Windows 10 security settings. To disable it go to Settings > Privacy > General and slide the option that says ‘Let apps use my advertising ID for experience across apps (turning this off will reset your ID)’ to the Off position. Open Cortana in your taskbar, and hit the notebook icon on the left-hand side of the popup. 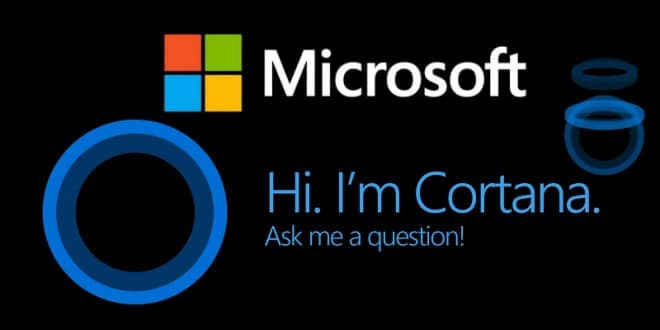 Click on Settings, and slide to Off the option that says ‘Cortana can give you suggestions, ideas, reminders, alerts, and more’. 3. Stop Getting to Know Me! Now go back into Settings and go to Privacy > Speech, inking, and typing. Here you must click ‘stop getting to know me. That will disable the infamous keystroke logger, and voice recorder that has been causing so much debate. At this point click on ‘Go to Bing and manage personal info for all your devices.’ Where you can delete everything that Cortana has up to that point managed to figure out about you by clicking on Clear at the bottom. Fifth on your to-do list: go to Settings > Network & Internet > Wi-Fi > Manage Wi-Fi Settings. Here is where you turn off Wi-Fi Sense. Do that by sliding 'Connect to suggested open hotspots' and 'Connect to open networks shared by my contacts' to the Off position. Stop Windows 10 sharing system files and updates to your PC (and from your PC to other users) by default. Go to Settings > Update & Security > Windows Update > Advanced Options > Choose how updates are delivered. Here you will need to make the choice to either completely disable ‘Updates from more than one place' or deciding to opt for sharing info just with ‘PCs on your local network’. Up to you. At this stage, you will want to stop Windows 10 from storing info on Microsoft’s servers. This is called OneDrive. click the up arrow in your system tray. 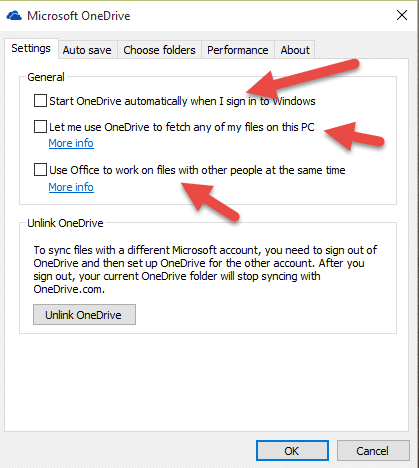 and 'Use Office to work on files with other people at the same time'. If you want to, you can also disable the Windows 10 Location service that is found directly under General. Here you can either get rid of it completely in Change or set it to Off only for that particular user. Continue down the list of apps under General and Location: disabling any of the features you do not want. Do consider carefully, however, as some options (like the Mail app looking in your contacts) may be beneficial. Microsoft Edge is the new Internet browser in Windows 10. It is set to communicate with Microsoft by default. To stop it, open Edge, click the menu (three horizontal dots) select Settings > View Advanced Settings. If you do not want your Windows 10 settings to be available on your request to other PC’s, then you should go to Settings > Accounts > Sync your settings and slide it to Off. SmartScreen is a feature that helps protect you from unwanted and malicious desktop programs. You should only disable this if you are certain about what you are doing. Otherwise, leave it on. To disable it go to Start menu > Control Panel. Select System and Security > Security and Maintenance, and choose ‘Change Windows SmartScreen settings’ from on the left. Now click the radio button next to 'Don’t do anything (turn off Windows SmartScreen)’. Finally, disable the other SmartScreen filter in Settings > Privacy > General and slide the option that says 'Turn on SmartScreen Filter to check web content (URLs) that Windows Store apps use' also to Off. 'Early next year, we expect to be re-categorizing Windows 10 as a "Recommended Update". Depending upon your Windows Update settings, this may cause the upgrade process to automatically initiate on your device.' said Microsoft's Terry Myerson. So, what does being forced to have Windows 10 actually mean? And why should you use this guide to disable Windows 10 data collection? Although this may seem inconsequential to many, others (often identified as conspiracy theorists until now) feel it should be possible to stop their PC communicating with Microsoft's servers if they wish. While it is true that under close scrutiny a lot of those data transfers seem harmless enough (lack identifying markers), it is worried that others are not so benign. It is also worth noting that while many people are informed about the security risks present in Windows 10, others may not be. In fact, it is probable that some users upgrade to Windows 10 without any deliberation (it is free after all.) Most experts agree that Windows 10 far exceeds previous versions, meaning it is quite possible that many users may are loving the invasive experience: clueless that the End User Licence Agreement (EULA) gave Microsoft specific permission to collect their keystroke data. On closer inspection, however, it becomes clear that Microsoft's initial 'no' is casually followed by a ‘with the customer’s permission’ yes Windows can. Knowing that the Windows 10 EULA does give Microsoft that customer permission, certainly does make the firm's initial No seem like a hasty attempt at misdirection. One is also niggled, throughout, by the realisation that if the answer was 'no' there would probably not be such a heated debate ensuing in the media. There is no doubt that Windows 10 keylogging (by default) could amount to a severe security risk. Our keyboards are where we type passwords, bank details (and other sensitive information) and these days it is well known that data theft from cybercrime is a very real and immediate threat. With that in mind, is it not alarming that our sensitive information could be hacked out of Microsoft’s hands? Even if that does not happen, can we trust Microsoft with such a treasure trove of information? Don’t forget that Microsoft openly admits to wanting Windows 10 on a Billion PCs within two years. That is seriously big data. Sadly, it seems that this debate is set to continue into the foreseeable future. Primarily because Microsoft is as close as it gets to ‘too big to fail’, and is comfortably positioned in a two firm Oligopoly that does not look on the verge of collapse. An elite position that lets the firm force users to do what it wants with their machines, as opposed to what they want. Of this Joe Belfiore has reassured us. The only solid advice available to Windows 10 users is to switch off as many of its privacy-invading features as you can. Something you will likely have to do sooner rather than later, now that Microsoft has begun ramming it down people's throats. Also If you decide that you are going to stick with Microsoft, you may want to check out our recent 5 best VPNs for Windows 10 article, which gives an in-depth analysis of what the best VPN options are when running the new operating system. Wow seems like alot of work the consumer has to suffer through. Here's a tip....Install Linux. Turn on your computer and your good to go. None of that other nonsense you have to go through with Microsoft junk is necessary. Hi! Thank you for comment of DoNotSpy10.....I have only Wondows7 instead of Windows10.... What is your opinion? Thank you for email response forward! You are welcomed! Hi Horvarth, This article my be useful to you. Hi Mick, Spybot Anti-Beacon is a good choice - other similar options are listed here (I use W10 privacy). Although these programs can be very effective, however, you should aware that you are giving them direct access to the deepest workings of your OS. So let’s just hope that their developers are honest! Use of such apps is very much at your own risk.